Anyone who loves clever iOS games knows the drill. An indie developer comes up with a genuinely clever idea, suited perfectly to mobile gaming. They release it to great acclaim. And then the vultures sweep in with poorly-made clones or outright frauds. It's a dark and predictable pattern in the App Store economy. Well, for once the tables have turned. For the past few months on the New York subway, I've seen people playing a mesmerizing game with a novel mechanic. It looked like a Breakout- or Arkanoid-style game, except each block requires multiple hits to clear, and instead of controlling a paddle you aim a railgun-like barrage of balls. It really drew my eye, but the longer I looked, the more obvious it became that it was poorly designed, full of ads, and generally low-quality. I decided to ignore it. Then, a couple weeks ago, I saw Max Temkin tweet that he'd been testing a new game, Holedown. I clicked through and saw a ball-bouncer in the same genre. But it looked polished. It had beautiful typography, quirky anthropomorphic balls, and proclaimed to be "a ball-bouncer with depth". Instead of hitting plain colored squares, your targets look like rounded-off Tetris pieces. It costs $3.99, paid upfront, no ads, no garbage. Ten years into the App Store, it may be the first reverse clone. Holedown delivers all the dopamine hits that I wanted from whatever that subway game is. (I couldn't even find it on the App Store, since I don't know its proper name and search terms like "ball bouncer" got me nowhere.) I'll admit that I was initially confused by the gameplay. Blocks move up the screen every turn — hit the top and it's a "crash" and game over. But my games kept ending after just a few shots, without crashing. I must have missed the tutorial text that I needed to collect crystals and upgrade my total shot count to keep playing further. Once this clicked, I was on a mad crystal quest. Upgrades unlock more shots, deeper levels, and longer ball barrages. The game ultimately tops out in a sort of endless mode where you can earn up to 99 balls per shot and dig for an hour or more on end. (Or, if you're doing it the healthy way, set a Screen Time limit and resume where you left off.) You can also play the earlier levels, aiming to beat them in as few shots as possible. The simple decision to use roundrects instead of square blocks adds strategy — your best shots are by hitting an exact bank off a corner to get the balls pinging back and forth sideways, multiplying their effect. You can also squeeze a shot between blocks that are diagonal from each other and watch chaos ensue. And to keep things moving along, the balls automatically accelerate the longer they remain in play. Throughout, there's a delightful soundtrack, but even more pleasing are the madcap plunking patterns of the bouncing balls themselves. One of my only quibbles is that while there's an option to turn off music, there's no separate switch for sound effects. That means that you can't play Holedown and listen to a podcast or your own music through headphones. Hopefully a 1.1 release will add that ability. Regardless of whether you've seen its inferior inspiration, I strongly suggest giving Holedown a try. If the 30-second App Store preview isn't enough to convince you, or you want some advanced strategy tips, I'm going to be doing something new. Monday, August 6 at 7PM EDT, I'll be streaming Holedown live on Twitch. Watch for a tweet on @_picomac when I go live, or follow the link on this episode page. I hope you'll be able to tune in, and until then, happy bouncing! The 2018 WWDC keynote brought tons of interesting updates, big and small, to all of Apple’s major OS platforms. (Well, except tvOS. Poor tvOS.) It also was the seventh such keynote since the death of Steve Jobs in 2011. Often, after these events, people who are disappointed in the outcome muse about which of their wishes would have been fulfilled if he was still alive. It’s a particular brand of resigned pessimism, and it rarely does any good. So don’t worry, I won’t be engaging in those counterfactuals. And I expect very few others will, largely because there is so little disappointment following this year’s keynote. Nearly everyone got something they wanted, from iOS automation to UIKit on the Mac to a more independent Watch. Instead, I’ll ask: what did we get only because of the composition of Apple’s leadership today? In other words, what 2018 OS features might not have survived Steve’s absolute veto power? I think the best place to observe this is in macOS Mojave, designed under the leadership of Craig Federighi. The (literally) biggest statement Craig made this year was the ten-thousand-point “No.” in response to whether macOS and iOS will be merged. Others have countered “Haha, but all the Mac apps will be iOS ports using Marzipan!” These retorts ignore the significant changes being made to the most central Mac app of them all — the one that is always running — the Finder. You know I'm here, right? I can hear you. Significant time in the onstage demo was given to Gallery view. It will be a great step forward, replacing the least useful (and likely least used) view in the Finder. Gallery view’s introduction immediately drew comments that “Cover Flow is back!” I understand why Cover Flow has been forgotten, but it’s not gone. In fact, it’s been in every version of the Finder from Leopard to High Sierra. 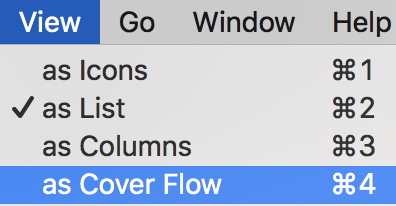 The question is: how and why did Cover Flow last this long? My theory is that it was protected by a double layer of nostalgia. Judging from his demos of it, Cover Flow was one of Steve Jobs' favorite features of the iPod era. And in turn, he loved it so much because of the nostalgic feeling of flipping through racks of vinyl LPs, marveling at their high-quality artwork. Letting it go — even to be replaced with a more modern interface incorporating editing and automation tools — is one more admission that those eras are gone forever. Fortunately, Mojave's new features aren't all just cold-hearted progress. Once the first beta was seeded, Guilherme Rambo noticed that beyond light and dark modes in Mojave, there are now customizable accent colors. This bit of whimsy is very similar to an appearance option from Mac OS 8, and breaks the 17-year dominance of blue and graphite over the Mac's appearance. I feel like the enforced conformity of One True Appearance was a Jobs-ism; after all, High Tech, Gizmo, and the other wild window appearances set for Mac OS 8 were drastically scaled back immediately after his return to Apple. And while macOS will almost certainly never again allow the delightful insanity that Kaleidoscope schemes provided in the Classic era, this is another small area where letting go is welcome. Ultimately, we can never know what might have been, but only what has come to pass. Even with privileged access to the inner workings of Craig Federighi's team at Apple, it would be impossible to pinpoint how these features came to be, and what hurdles — real or imagined — they overcame to come into existence. But one way or another we got them, and I see them as signs of a promising future for the Mac. I’ve been without a weather app on my phone for almost a week now. On May 24, through some combination of laziness, spite, and GDPR, Weather Underground’s Storm app shut down. The writing had been on the wall for iPhone X users for months, even before official warnings came. Long after every other app I use on a daily basis had pushed an iPhone X update, Storm remained letterboxed. But despite the ugliness, it was still the only app that put all the weather data that I wanted in one place, and it stayed on my homescreen. Then weird things began to happen. A minor release didn’t change the interface, but introduced a bug where users who’d paid to remove ads started seeing them again. The issue was resolved — at least eliminating third-party ads — but soon that slot began to plug “Storm Radar”, an app by a different developer but with very similar branding. You really want to use Storm Radar. It’s great. It’s by our new corporate overlords, The Weather Channel. You know, the people whose website used to be the best litmus test for the effectiveness of your ad blocker. Go on, try it, you'll like it. I did try it, and I can say with no reservations: Storm Radar is a bad app. It feels like a Windows app ported to iOS. Banner ads float in the middle of nowhere on the iPhone X screen (and the option to pay for their removal is gone). Its map tiles and color scheme are hideous. It has no 3D touch actions on its Springboard icon. And worst of all, it's a one-trick pony. Granted, that trick — good predictive radar animations — is unmatched in any other iOS app. Except, of course, for old Storm, which separated past and future radar, avoiding the display and navigation bugs present in Storm Radar. Having dismissed Storm Radar as Bad, I ignored it and continued using Storm. Until the dire warnings began. "Upgrade required!" (Remember, to an app with a similar icon, different name, and different developer — perhaps putting that message in violation of App Store rules.) Then "3 DAYS LEFT", 2, 1, and 0. "This app is no longer supported." It functioned for a few more hours, and then, it would seem, Weather Underground revoked their own API key so it displays blank maps, blank forecasts, blank graphs. These features are now buggier and more fragmented than before. Storm Radar shows shear, but not reliably. WunderStation — yes, a fourth app, but only for iPad! — shows me the graphs I want. Nothing puts them all in one place as well as Storm already did. And that's the worst part: a company with great data has no incentive to deliver a good iOS experience. A parallel problem has arisen with Electron apps replacing native apps on Mac OS. And why should Weather Underground spend money developing great apps when the market price of an app is free? A lousy app or bad web-based experience or even nothing at all earns the same revenue. Weather Underground at least licenses their data through an API, with fees high enough that indie developers make it a paid option. But that passes the risk onto small companies that shouldn't be shouldering it for a giant corporation. So there's some small hope that someone else will make the next great weather app, and charge me a fair price to send nearly all of that money along to Weather Channel HQ. But even more than when I discovered Storm a couple years ago, I wouldn't bet on it. And that, rather than the missing icon on my homescreen, is the true loss. It goes without saying that Siri has a lot of catching up to do. Anyone who hasn’t given up on it entirely will want to see significant improvements in iOS 12. I’m not too optimistic, so I’m asking for something smaller: just a little self-awareness. I’m not talking about eliminating the dad jokes, though that would be wonderful. All I’m asking for is some simple connect-the-dots, making Siri not look oblivious when asked basic information about the device it’s running on. There are several pieces of information that are available onscreen in built-in, Apple-created apps, that Siri completely falls down when asked about. If you’ve ever been to the Apple store for a repair on your iPhone, you know the first thing they ask is whether you’ve backed it up to iCloud. Genius Bar techs have memorized the four-tap sequence they need to access this information in Settings, but think how much time that wastes in the aggregate! Yet asking Siri, "When was my last iCloud backup?" produces one of three unhelpful responses. "Everything you need to know about Apple products is at Apple's website." What does that have to do with iCloud? "Apple.com should be able to answer that question, and more." You know that icloud.com is a thing, right? "Allow me to direct you to Apple's rather fabulous website." For that one, they really punched up the smugness factor in the voice improvements made in iOS 11. And all of these are failures to parse the question. In fact, they are keying on the word iCloud and ignoring the rest. Just saying “iCloud” alone produces the same stock phrases. "How many steps have I taken today?" "I can't answer that on your iPhone, but you can find it in the Health app." Even that didn’t used to be the case with the Home app. For years, most commands with the word “home” got routed to the HomeKit or Maps APIs, making it impossible to launch the app via Siri at all. I reproduced this as recently as a few days ago, but it seems to be fixed at the time of writing/recording. Well, unless you have another app installed that has a similar name. Maddening. Don’t let Apple tell you that they’ve added support for follow-up questions to Siri. When the Siri prompt sounds, it’s actually starting again from zero. You can ask “What’s the weather?” in response to the follow-up, and it will go fetch the forecast. A simple problem that should be constrained to two choices is instead opened up to the entire universe of possible commands, inviting poor results. So this is all I ask: Siri, please listen to yourself. Please learn about where you live. Do your homework, and we can talk again this summer.